Designation: Department of Environmental Health, Faculty of Public Health, University of Benghazi. List of Author(s): Mohamed H, Alfutmani A, Omar K, bokhatwa O, Alreshy A. Copyright: © 2018 Mohamed H. This is an open-access article distributed under the terms of the Creative Commons Attribution License, which permits unrestricted use, distribution, and reproduction in any medium, provided the original author and source are credited. Background: Ammonia is corrosive and irritating gas, it uses in several industries, the main rout of exposure is inhalation, and it can cause irritation to the upper respiratory system. Methods and Material: This study was a cross sectional, it was conducted in ammonia factory in Elbrega city, Libya, the sample size was about 62 workers, the data was collected by using questionnaire method, and this information was analyzed by using SPSS software. Results: this study indicated that about 38.7% of the sample have nose irritations, 37.1% have throat irritation, and 27.4% and 12.9% for eye and mouth irritations. In addition, There are relationship between years of experience and eye, nose irritation, while study showed that no relation between years of experience with mouth and throat irritation. Furthermore, there are no correlation between qualification level, smoking and working hour with irritation effects of ammonia. Conclusion: Exposure to ammonia gas causes irritation to the upper respiratory tract system and eyes, therefore, suitable personal protective equipment for ammonia exposure must be worn. Ammonia, Respiratory system, Exposure, Irritation, Health effects. Ammonia (NH3) is corrosive, highly irritating gas and it has alkaline possessions . It generates naturally in the environment and it is recognized as hydrous ammonia, recently, ammonia is widely used in several industries such as a fertilizer, explosives, refrigerant gas and manufacture of plastics, dyes, and pesticides . Moreover, in Petroleum industry, ammonia is used in neutralizing the acid constituents of crude oil and for the protection of equipment from corrosion . Ammonia enters the body through respiratory system and produces its effects directly on the upper respiratory tract , which the absorbed ammonia is particularly dissolves in H2O and in the mucus fluid of the human body, and it covers the mucous liner of the respiratory system to produce ammonium hydroxide (NH3OH), which it is a strong base. According to Canadian Centre of Occupational Health and Safety , ammonia from eyes exposure causes eye irritation, burning sensation, Swelling, lacrimation and temporary or permanent blindness. While ammonia from Ingestion exposure causes nausea, vomiting, abdominal pain, burning to mouth, throat, esophagus, and stomach. In addition, lips swelling, and voice box (larynx). Furthermore, ammonia from Inhalation exposure causes mouth, nose and throat irritation, coughing, wheezing and burning, lung irritation. Additionally, exposures to high levels of ammonia concentration lead to pulmonary edema. Lastly, Ammonia from skin exposure causes skin irritation, blistering, swelling, ulceration, and burns. These effects have been indicated by several epidemiological studies; Rahman et al. demonstrated that prevalence of acute respiratory symptoms was higher among worker who exposed to ammonia and they found a significant decrease in FVC and FEV1 during the work shift among workers in urea factory. Moreover, Medina-Ramon et al. found that females who exposed to ammonia suffer from asthma and chronic bronchitis or both of them. Additionally, Ali et al. found that workers who exposed to more than 50 mg/ m3 of ammonia level had Significant decrease in the lung function test. Besides, Ballal et al. indicated that the exposed workers were at high risk of respiratory symptoms, which are Bronchial asthma, chronic bronchitis. This study will focus on the irritation effects of ammonia on upper respiratory system of exposed workers. To evaluate the irritation effects of ammonia on workers at ammonia factory of El-brega Company in elbrega city and determine the relationship between these effects and years of experience, the working hours, smoking habits and qualifications of the workers. This study conducted in ammonia factory at the Alberga petrochemical company in Albrega city. This study involves descriptive research that adopts a quantitative and cross- sectional approach. It was based on questionnaire to evaluate the irritation health effects when workers exposed to ammonia in this factory. The data was collected by a multiple choices questionnaire (Appendix A), between period of time 8 to 9 august 2017. The questionnaire was the main research tool, it was developed by health and safety executive HSE  with evaluating the information about irritation adverse effects of ammonia. Furthermore, five questions were added about demographic data, they were added to collect general information about the workers involved, including gender, age, experience of years, hours’ work, level of education, smoking. The sample included all workers in ammonia factory at Al-brega Company. The total sample size is 100, 100 hard copies of the questionnaire were distributed among workers in the factory. However, only 62 copies of questionnaire were returned to the researchers. Statistical Package for Social Science (SPSS) version 22 was used to analyze the collected data. The percentage of demographic variables was determined. Furthermore, T test was used to determine the association between these variables with irritation effects of ammonia on eyes, nose, mouth, throat and mouth. This study was conducted after approval had been obtained from ammonia factory, following the sending of a preliminary request letter to the manager of the ammonia factory to obtain permission to carry out this study among workers, he provided a preliminary agreement by signing the letter of request. The limitations of this study were unavailability of spirometer to measure the lung function test of the workers. Therefore, the study changed the method of sample collection to using questionnaire. Additionally, a little researches available about ammonia irritation effects, so it has difficult to get information on the same topic, also, long distance between Benghazi city and Elbrega company, which all the researchers live in Benghazi city which is about 250 K.M, where take approximately three hours driving by car. In this study, 100 questionnaires were distributed among workers in ammonia factory. Only 62 copies were completed and returned. So the response rate is 62%. The results demonstrate that all workers were male, so the sample was homogenous. 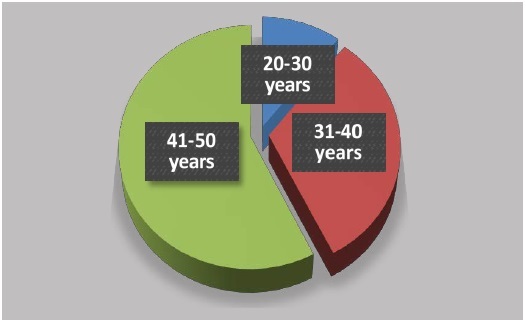 Figure 1 presents that the largest proportion of workers lies in age category 41-50 years old with percent 57% next comes 31-40 age category with 32%, while smallest proportion had 20-30 years old with percent 11%. 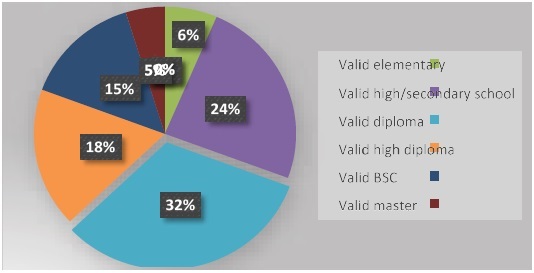 Figure 2 demonstrates that the highest percentage of sample holds diploma degree and high school with 32% and 24% respectively. Frequency and distribution of workers' age in ammonia factory. Figure 1: Frequency and distribution of workers' age in ammonia factory. Frequency and distribution of workers' level of education in ammonia factory. Figure 2: Frequency and distribution of workers' level of education in ammonia factory. Figure 3 represents that the data shows that the largest proportion of sample had more than 26 years of experience with 34 %, while the smallest proportion had 0-5 and 6-10 with 7% and 6 % respectively. Frequency and distribution of workers’ years of experience in ammonia factory. Figure 3: Frequency and distribution of workers’ years of experience in ammonia factory. 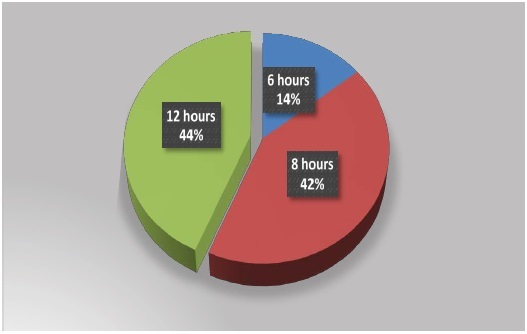 Figure 4 represents that the largest proportion of the sample works for 12 hours a day with percent 44%, while 42% of sample works for 8 hours a day. However, the smallest proportion of sample works for 6 hours a day is 14%. 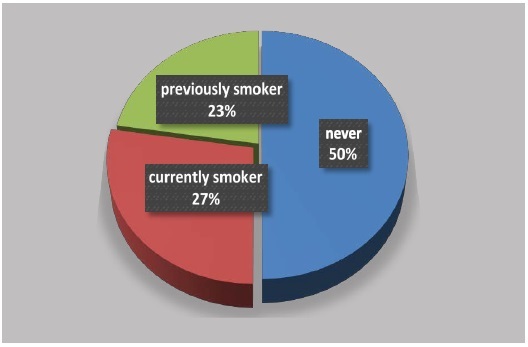 Figure 5 represents smoking habits of workers; it shows that 50% of them are never smoking, while 27% are current smoking, and 23% of worker previous smoking. 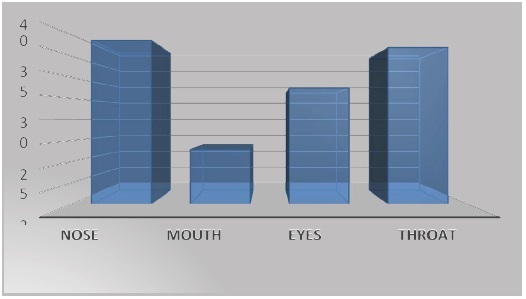 Figure 6 indicated that about 38.7% of the sample have nose irritations, 37.1% have throat irritation, and 27.4% and 12.9% for eye and mouth irritations. 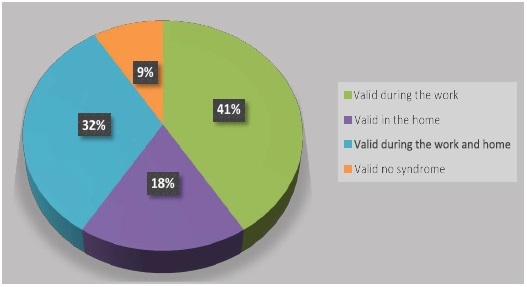 Figure 7 showed that highest percentage of sample say that symptoms of ammonia exposure appear during the work, which was 41%. 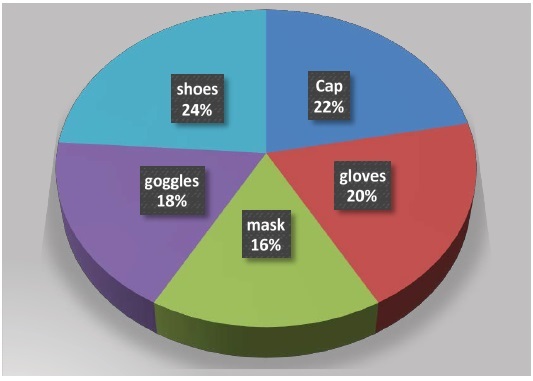 Figure 8 showed the percentage of using of personal protective equipment in the factory, which are 24% for using shoes, 22% for using cap, and 20% for using gloves. Frequency and distribution of workers' smoking habits in ammonia factory. Figure 5: Frequency and distribution of workers' smoking habits in ammonia factory. Irritation effects of ammonia among workers in ammonia factory. Figure 6: Irritation effects of ammonia among workers in ammonia factory. Time of irritation symptoms appear. Figure 7: Time of irritation symptoms appear. Using of personal protective equipment among workers in ammonia factory. Figure 8: Using of personal protective equipment among workers in ammonia factory. Table 1 showed there is a significant association between years of experience and eye and nose irritation since P<0.05, which are 0.037 and 0.03 respectively. While, the study demonstrated that no relation for years of experience with mouth and throat irritation because P>0.05. Table 1: Years of experience and eyes, nose, mouth, and throat irritation using (T-test). Besides, Table 2 demonstrated that there is no correlation between workers, qualification level and eyes, nose, mouth, throat irritations since P-value >0.05. Moreover, Table 3 indicated there is no relationship between working hours and eye, nose, mouth, throat irritations because P-value >0.05. Additionally, Table 4 demonstrated that smoking habits did not associated with ammonia irritation effects on eyes, nose, mouth and Throat since P>0.05. Table 2: Qualification level and eyes, nose, mouth, and throat irritation using (T-test). Table 3: Working hours and eyes, nose, throat and mouth irritations. Table 4: Smoking habits and eyes, nose, throat and mouth irritations. According to current study, the exposure to ammonia causes nose, throat, eyes and mouth irritation. The higher symptoms of irritation were belongs to nose and throat irritation. This results comes in agreement with study have done in 2004, which it found exposure to high concentration levels of ammonia leading to nose and throat burning while the exposure to low levels causes irritation to nose and throat . Additionally, Sekizawa and Tsubone  found exposure to 20 ppm or more of ammonia levels cause immediate nose and throat irritation. Furthermore, the present study found that 27.4% of the participants have eyes irritation, besides, New York state department of health  demonstrated that low concentration level of ammonia cause eyes irritation, while the higher levels leading to eyes damage and blindness. Additionally, this study found that 12.9% of the exposed workers suffer from mouth irritation, on the other hand, there was no published study tested this effect. According to this study, there is a significant association between years of experience and nose and eyes irritation because P value was less than 0.05, which are 0.03 and 0.037 respectively. On the other hand, Holness et al. demonstrated that no correlation for years of experience with mouth and throat irritation, which found the exposure to ammonia to long time did not related to eyes and nose irritation. The current study presented that there is no correlation between workers’ qualification level and eyes, nose, mouth, throat irritations of exposed workers since P-value <0.05. However, there no study determined this relationship before now. The present study recommended that no relationship between working hours and eye, nose, mouth, throat irritations of exposed workers because P-value >0.05, and that cannot be compared to previous studies since there is no availability of scientific research tested this type of association. Smoking habits did not correlate with ammonia irritation effects on eyes, nose, mouth and Throat since P>0.05. However, the previous studies excluded the smokers from their sample and considered them as confounding factor  because the smokers inhaled 0.8 mg of ammonia per day (based on 20 cigarettes each day) . The main aim of the current study was to determine irritation health effects of ammonia gas on workers’ eye, nose, mouth and throat in ammonia factory at El-brega Company. Besides, the study tested the relationship between these effects and years of experience, level of education, working hours and smoking. The study indicated that nose and throat irritation effects were the more symptoms that workers suffered from, and then come eyes and lastly, mouth. Furthermore, it showed that there was a positive relation between years of experience and nose and eyes, while there no effect on mouth and throat. Moreover, level of education, smoking and working hours did not have a significant influence on the irritation effects of ammonia. In order to improve the awareness of workers about health effects of ammonia gas, the training programme should be introduced regarding safety policy at El-brega Company.